Hollyhocks. Even the name conjures images of red barns and white picket fences. These humble flowers were a common fixture in cottage gardens and rural farms of yesterday, where they were often planted to hide eyesores, such as an outhouse, rubble pile or decrepit shed. While you might not have an outhouse in need of disguise, don’t discount hollyhocks (Alcea rosea). These biennial plants are at home in modern landscapes, too. Plant them at the back of a cottage garden or spread them in front of a fence. Hardy in U.S. Department of Agriculture plant hardiness zones 3 through 9, hollyhocks are vigorous, low-maintenance plants that self-seed aggressively. Plant them once and you’ll likely have hollyhocks for years to come. You can probably find hollyhock plants at your local nursery, but they don’t transplant particularly well and are best grown from seed. 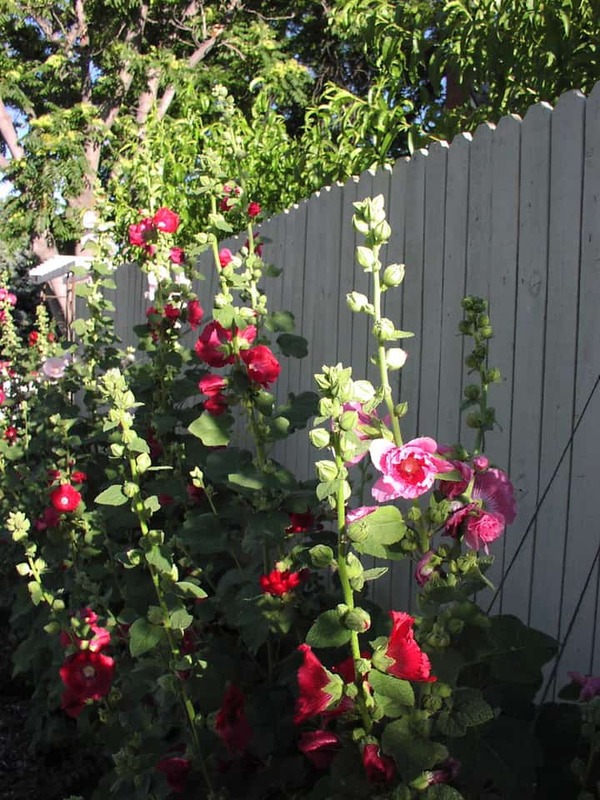 Hollyhocks tolerate partial shade, especially in hot climates, but they bloom best in full sun. Sow seeds directly in your garden from spring until two months before the first heavy frost in the fall. Amend the soil before planting with compost and manure to improve drainage. Dig a balanced fertilizer in at the same time or add organic sources of phosphorus and nitrogen, such as bone and blood meal. Hollyhock seeds need light to germinate so don’t worry about covering them. After planting, keep the soil evenly moist, but not soggy. Hollyhocks won’t germinate or grow well in dry soil. Thin young seedlings so they stand 12 to 18 inches apart. Continue to water hollyhocks during dry periods throughout the summer. Hollyhocks bloom from midsummer to fall, but to extend the bloom even more, cut spent stalks back to the ground. If you want the plants to self-sow, though, leave a few flower heads through fall to develop and disperse seeds. Remember, hollyhocks are biennials. They won’t bloom the first year after planting, but instead develop strong roots and bushy, vegetative growth. Hollyhocks flower the second year, after which they often wane. New plants form from the seeds they drop, but they might not bloom predictably every year. Hollyhocks suffer from a few insect and disease problems, but most of these can be prevented or treated with good cultural practices. Rust is probably the number one problem gardeners experience with hollyhocks. It appears as brown lesions on the lower leaves, followed by yellow or orange spots and brown pustules. The infection slowly spreads to the upper portion of the plants, as well, slowing growth and causing disfigurement. To prevent rust, grow disease resistant varieties and space them so air circulates freely. Use soaker hoses or drip irrigation because wet leaves spread the disease. Remove infected leaves immediately and cut down and discard entire stalks after flowering is complete. Clean up any garden debris in the fall because the disease overwinters here. Beetles, leafhoppers and mites also afflict hollyhocks, but their damage isn’t usually serious. Handpick beetles and drop them in a bucket of soapy water. Treat leafhoppers and mites with a good dousing of water. Old-fashioned hollyhocks are available in pastel and bright colors, including red, pink, purple, yellow and white. These regal plants grow 6 to 8 feet tall with a spread of 2 feet wide. In addition to these old favorites, new hybrid plants are available with single and double petal forms and come in an even wider array of shades. Below are just a few of our favorite hollyhocks. ‘Summer Carnival,’ is a compact hollyhock, growing only 4 feet tall. It has extravagant double flowers. For an exotic departure from traditional hollyhocks, try ‘Nigra,’ which grows 5 feet tall and produces deep brown to purple flowers. For a more traditional plant, try ‘Powder Puff,’ which grows 6 to 8 feet tall and produces showy, double blossoms in white, pink, purple, yellow or red. For a romantic cottage effect, you can’t go wrong with ‘Peaches n’ Dreams.’ The ruffled double flowers come in soft shades of apricot to almost raspberry. Gorgeous! Hollyhock from Cornell University Home Gardening. How to plant Hollyhock seedlings on YouTube. How to collect Hollyhock seeds from existing plants on YouTube.